In 2012, Baseball America rated Christian as the 29th-best prospect in the Red Sox organization. They moved him up to #19 in 2013. And he went up to #12 in the offseason before 2014 spring camps opened. Christian is bilingual and communicates well with English-speaking and Spanish-speaking pitchers alike. Vazquez is a strong leader with a true passion for the game. In 2014, Vazquez was invited to play in the All-Star Futures Game. Ask any coach or player about Christian since his arrival with the Red Sox on July 9, 2014, and they'll tell you that Vazquez has made a near-seamless transition to the Majors. "He doesn't act like he's young. He has a real maturity about himself," former teammate David Ross said. "He really carries himself well and has great leadership qualities. I don't look at age. I look at guys personalities in this environment, and he fits right in." Vazquez has done his best to ask questions and absorb information, relying heavily on Ross and pitching coach Juan Nieves to help guide him in the right direction. "He sees the game inside the game, which is very impressive," Nieves said. "It also comes from his savvy. He sees things that happen in the game that most people don't look at. Seeing him behind the dish is great. He receives the ball beautifully and is very energetic." Manager John Farrell also sees the confidence Vazquez has in his receiving skills. "He makes every pitch seemingly look like a strike," Farrell said. "I can tell you, there's a lot of comments from the dugout when you think there's a ball that is just off the edge or looks to be a strike. Because he presents it so well and his hands are so strong that seemingly his target never gives with a mid-90-mph fastball. It's been impressive, his receiving." While the team has been thrilled with the progress Vazquez continues to make on a daily basis, it's not like the Red Sox didn't see it coming. "If you want to be a good catcher, you have to take on that personality. I could tell he had that quality the first time I saw him catch in Spring Training," Ross said. "He didn't shy away from conversation, and he understood what he wanted to do. He talked to the pitchers and figured out how to get the most out of them. He knows pitchers' personalities. He is mature beyond his years." 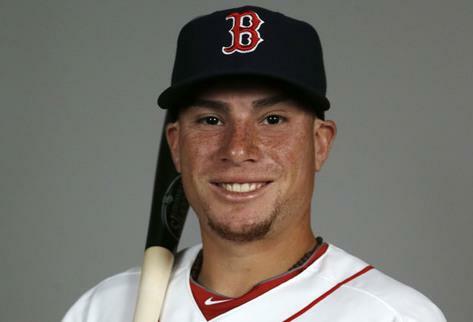 June 2008: Vazquez signed with the Red Sox, via scout Edgar Perez, after they chose him in the 9th round, out of the Puerto Rico Baseball Academy. Christian is the first player drafted from the Puerto Rico Baseball Academy to reach the big leagues. Jan 12, 2018: Christain and the Red Sox avoided arbitration, agreeing on a one year deal worth $1.45 million. March 24, 2018: The Red Sox and Vazquez agreed to a three-year contract extension through the 2021 season with a club option for 2022. Christian is at his best when he shortens his swing and drives pitches up the middle. He projects as a decent hitter. But he strikes out too often to hit for a high batting average. In 2012, Vazquez shortened his swing and focused on a more up-the-middle approach. Vazquez should improve his ability to get on base and swing at more strikes. Vazquez may not hit for much power because he doesn’t hit the ball in the air often. In 2014, Pawtucket coaches worked with him to quicken his swing load and to better recognize breaking balls, but he emphasizes contact over power and can serve breaking pitches to right field. And in 2016, Christian was getting more lessons to improve his contact rate. "We're trying to quiet some things down in terms of his approach," Pawtucket manager Kevin Boles said. "He's got some moving parts to his swing, but he has impact when he makes contact. We're working on having him make a higher frequency of contact, doing the things he does well." As of the start of the 2019 season, Christian's career Major League stats were a .246 batting average, 10 home runs and 227 hits with 80 RBI in 922 at-bats. Vazquez grew up in Puerto Rico watching Pudge Rodriguez's catching instruction video. Apparently the lessons were learned, because Christian is far above-average for his overall defensive ability back there. Christian's defense is the best part of his game. He has impressive catch-and-throw skills. In 2013 and 2014, he was known as one of the top defensive backstops in the minors. Vazquez' average arm strength plays up because he gets rid of the ball quickly and his throws are very accurate. He regularly gets the ball from home to second in 1.75 to 1.9 seconds. Few can match his ability to control the running game. He has a reputation as a very good catch-and-throw guy behind the plate. In 2011, Christian threw out 33 percent of South Atlantic League base-stealers. In 2012, he caught 42 percent of Carolina League base-thieves. In 2013, Vazquez nailed 46 percent of runners who tried to steal (47 of 103). In 2014, Vazquez threw out 15-of-29 baserunners who were trying to steal. His 52-percent success rate was tops in the Majors among catchers with at least 25 games played. In 2016, Christian nailed 35% of runners trying to steal a base, 8 of 23. In 2017, Vazquez caught 21 of 50 guys, an impressive 42 percent. In 2012, managers rated him the Carolina League's best defensive catcher. In 2011, he received the same honor in the South Atlantic League. Vazquez has improved his blocking and receiving skills, and his passion for baseball shows on the field. He's a natural leader who's learning to call a game. He works real well with the pitchers. Christian's defense will carry him. But his bat will dictate whether he's a backup or sees a lot of playing time. Pitchers rave about the way Vazquez calls a game. They rave about his judgment when it comes to understanding their strengths and weaknesses and how reads hitter's swings. Pawtucket manager Kevin Boles said of Christian: "With the skill set that he has, the way he’s able to slow down the game and impact the game from behind the plate, he’s not afraid to take risks. Trust and belief in his ability to call a game has allowed Vazquez to find success in not only breaking in the younger members of the Red Sox's starting rotation, but also working with veterans like Clay Buchholz. In a weekend series against the Angels, in which Vazquez caught Allen Webster one night and Buchholz the next, he showed the depths of his knowledge and skills. Finding a comfort level with Webster after spending much of 2014 with him at Triple-A Pawtucket, Vazquez wasn't afraid to go away from the fastball and use the breaking ball in a fastball count. That type of thinking got high praise from his manager after the game, and it helped Webster earn his second win of the season. "You can see his leadership skills when he goes to the mound to talk to pitchers," Nieves said. "I've seen some fire in him to push the guys. He's also able to be firm. That relationship will grow." Vazquez was behind the dish for all the innings in a 19-inning game, acting like a hockey goalie, blocking balls off his neck and mask. Manager John Farrell said about Christian, "I think he's ready and capable of handling the starting catcher role. I think what will be as important is who is paired up with him. That's not to eliminate anyone that's here. That's not to suggest who that might be. "Christian, I think, in short order, has gained a reputation around the league to be somewhat of a shutdown thrower with the aggressiveness of his picks, of his throws to bags. Like we said, he's a focal point for a team when they're on offense, to have to contend with behind the plate." Christian has a strong, wide frame in the mold of Ivan Rodriguez, whose catching video he grew up watching. He gets out of the crouch quickly and displays a plus, accurate arm. Scouts uniformly laud Vazquez’s defense and the way he calls a game for such a young catcher. With his his defensive prowess, Vazquez won’t have to be much better than a fringe hitter with poor power to serve as a backup catcher for many years, though he projects to be capable of starting for many teams. Every winter, Vazquez works out with all the Molina brothers in Puerto Rico. And Red Sox righthander Joe Kelly can see how it has paid off. "He's Yadi," said Kelly, a former Cardinal. "That's his nickname. I call him that. He works with them every offseason and works with Jose, he works with Bengie, he works with all of them. His behind-the-plate skills are awesome. He's definitely a mini Yadi." What reminds Kelly of Yadier Molina? "How they catch, how they set up," said Kelly. "I wouldn't say they think the same, but he's getting there as far as reading hitters and stuff. He definitely has some of the tendencies and he's just the right amount of cockiness and confidence behind the plate that's perfect for a catcher. April 15, 2019: Christian, the catcher who turned into a second baseman for a day, had two words: Bring it. Due to a variety of injuries, illnesses and maintenance issues, the Red Sox thrust Vazquez into emergency duty and had him make his first start in the Majors at second base. The crowd roared and Vazquez sprinted off the field with a glow on his face. It was the best moment for the Red Sox in an otherwise nondescript 8-1 loss to the Orioles. “It was fun. Something different,” Vazquez said. “I didn't want to mess Bogey up [with a flip]. I want to hit him in the chest. I was trying to go under but not a good idea." Christian is a below-average runner, but at least he is average for a catcher. And his instincts are well above-average. March 25, 2015: Vazquez began the season on the D.L. with discomfort in his elbow. April 1, 2015: Christian missed the entire season, as the Red Sox announced he would undergo Tommy John surgery on his right elbow. Vazquez then dealt with two issues coming back from the procedure. Not only did he need to return to throwing, the concern of pitchers who had the surgery, but he also had to work on swinging a bat. "I first got to swing a bat about a month before I could throw," Christian said. "The good thing was I spent time in the winter leagues as a DH, so I got extra work on that." July 8-Sept 1, 2018: Christain was on the DL with a right finger fracture. July 10, 2018: The Red Sox will be forced to endure an extended stretch without catcher Christian Vazquez, who will undergo surgery on his fractured right pinkie finger and is expected to miss six to eight weeks.